iPad mania: Will it save the newspaper industry? Hundreds of shoppers lined up for hours in nine countries around the world as Apple's new iPad became available for sale on Friday. 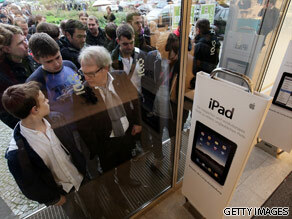 Shoppers wait to purchase their new iPad. The iPad, which beat industry expectations by selling 1 million tablets in the first month of sales in the U.S., was released in Australia, Canada, France, Germany, Italy, Japan, Spain, Switzerland and the U.K.
Market researcher IDC estimates that nearly six million iPads will be shipped by the end of 2010. The sale of the iPad is only days before two major news sites in the U.K. began to charge readers for viewing content online. "The Times of London" and "Sunday Times" will begin to charge readers $1.43 for a one day subscription or $2.87 per week to access both sites. The iPad is unique, analysts say, because it is creating a new market segment in between mobile phones and computer laptops. How much this new segment becomes a "game changer" is still to be seen, analysts say, but it is generating excitement among a diverse set of industries, including application designers, book publishers and news media organizations. Many are even saying that the iPad could be seen as the saviour of the newspaper industry. Do you think that iPad will change the way you consume media? Will it help newspapers? Are you going to buy one? After years of being ravaged by war, the Iraqi capital of Baghdad is finally getting a bit of pizzaz back in its step as the city's symphony orchestra begins drawing in big name musical guests to its concert halls. Llewellyn is your Connector of the Day. 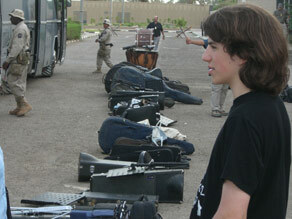 Llewellyn Kingman Sanchez Werner is a 13-year-old music prodigy from Los Angeles and recently brought an Iraqi audience to their feet after performing with the national symphony orchestra. The concert comes as the city struggles to revive its once bustling cultural scene. Llewellyn studies at the acclaimed Julliard School of Music in New York City and played Gershwin's "Rhapsody in Blue" to the crowd of more than 250 guests. The American began learning piano at the age of two and composed his very first piece at the age of five. When Llewellyn was only six years old, he already was a full-time college student studying music and today is studying for his second degree.